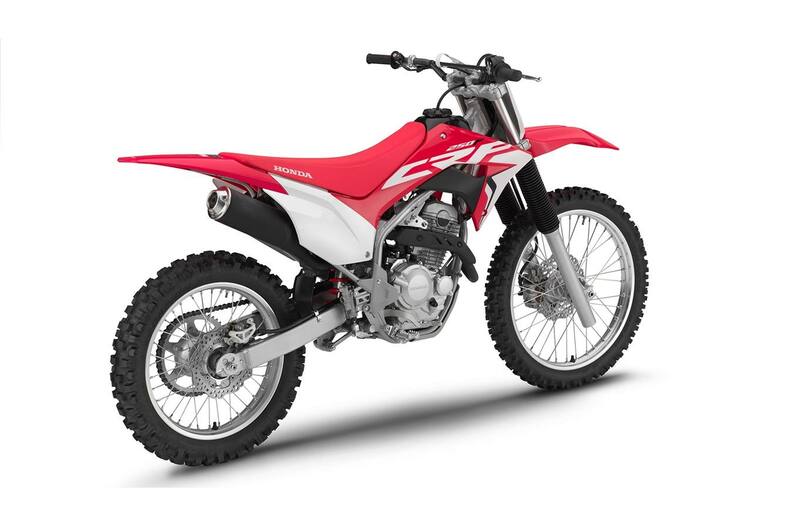 Dependable power: Responsive 250 cc single-cylinder air-cooled 4-stroke engine with 4-valve cylinder head offers plenty of user-friendly power and torque, spread over a wide rpm range. 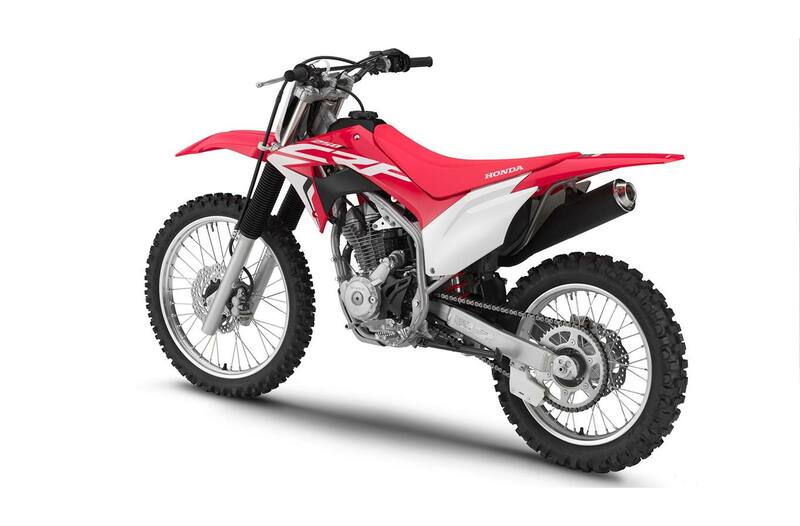 A 4-valve head provides a host of improvements over a 2-valve head, including higher rev capability, more efficient combustion, greater peak horsepower, and reduced fuel consumption. Electric start: The fun begins at the push of a button. 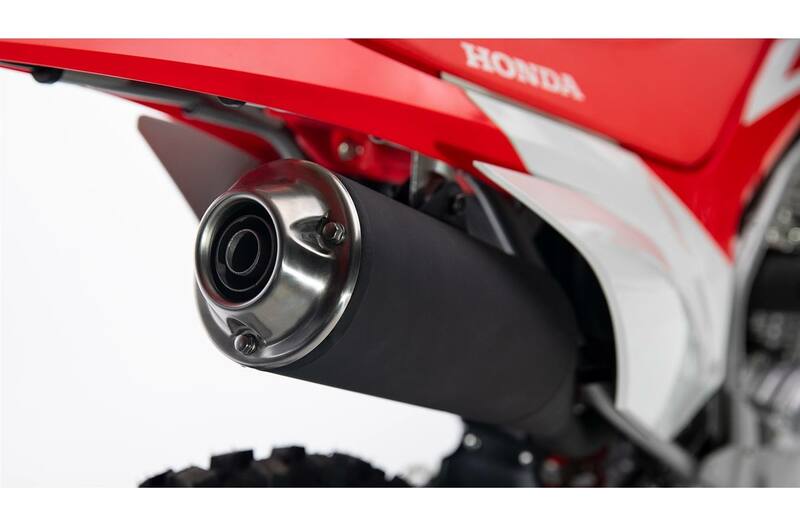 Crisp throttle response: PGM-FI electronic fuel injection system with a 34 mm throttle body contributes to the engine's crisp throttle response and smooth power delivery—helping to make the CRF250F easier to handle on even tough trails. Info at a glance: Handy LED lights indicate ignition ON, low fuel, and PGM-FI status. 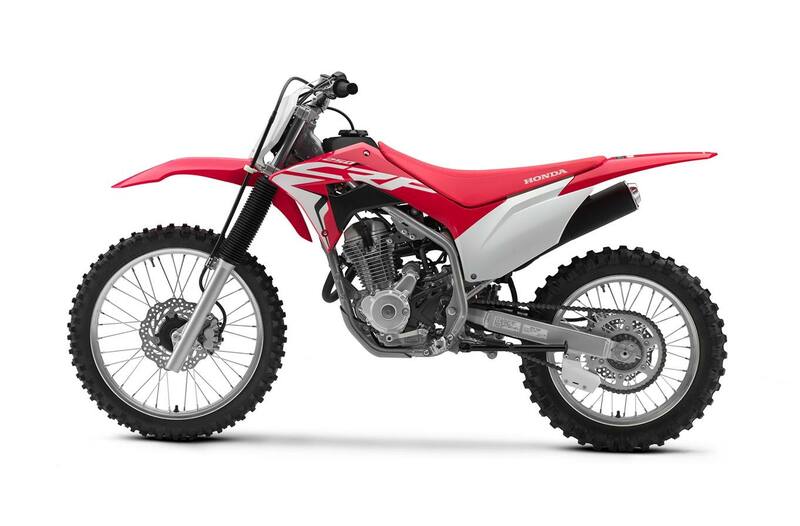 No second guessing if you've left the key on or you're about to run out of gas, and another way the CRF250F helps young riders learn the basics of motorcycle operation. Heavy-duty clutch: Manual clutch is built tough, yet provides smooth, progressive engagement with a light lever pull. Smooth shifting: Five-speed transmission clicks into gear easily and securely. Increased durability: Heavy-duty #520 O-ring-sealed chain provides increased durability and reduced maintenance. 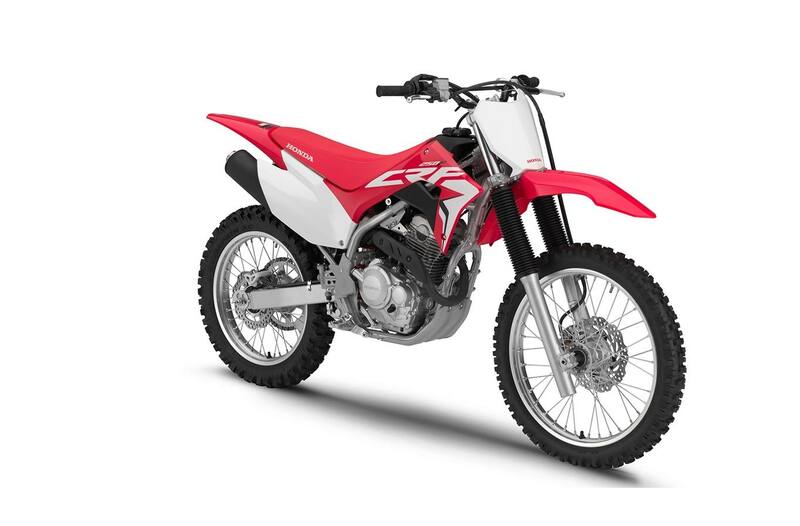 Twin-spar frame: CRF-R-inspired twin-spar frame with box-section aluminum swingarm combines strength with light weight. 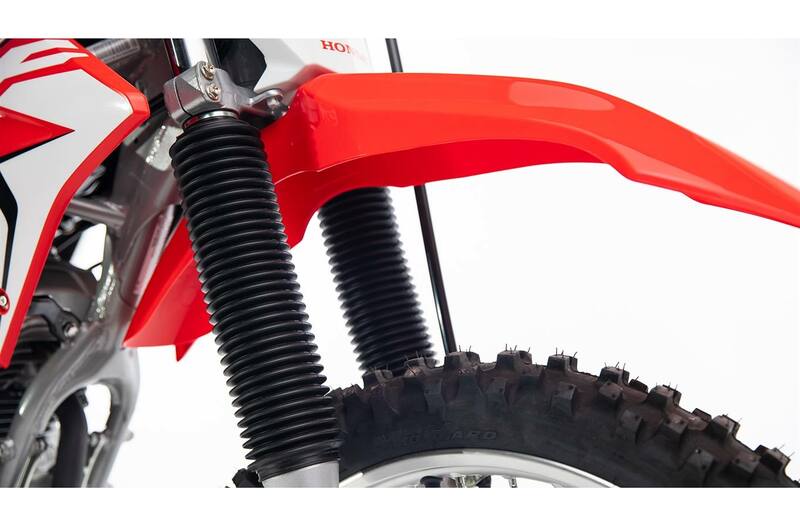 Showa control: 41 mm leading-axle Showa front fork boasts a trail-smoothing 216 mm (8.5 in.) of travel. 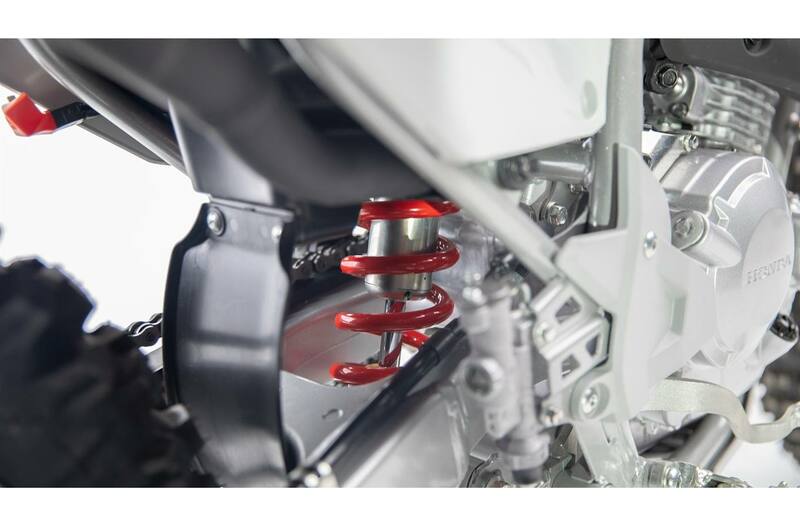 Smooth ride: Pro-Link® rear suspension with Showa shock rides on needle bearings, which reduce friction for smoother movement and thereby improve bump absorption and increase durability. Better braking: Wave-style front and rear brake discs dissipate heat quickly for exceptional stopping power. 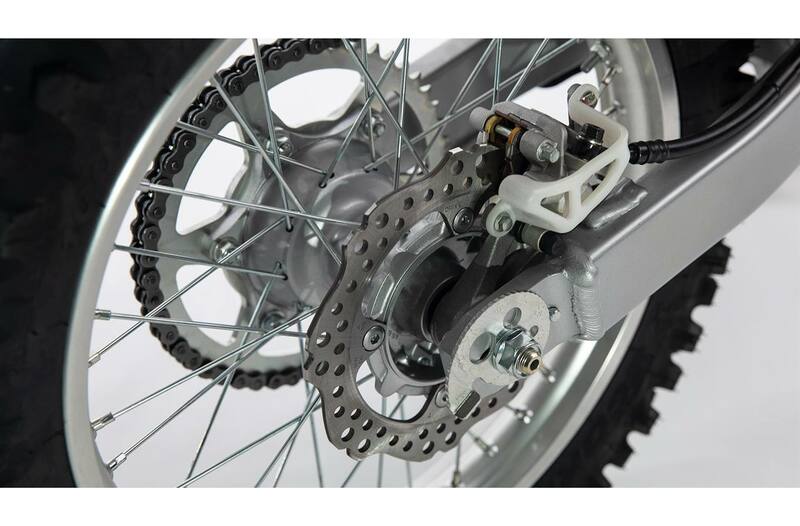 Easy maintenance: Snail-type adjusters make it easy to get chain tension and wheel alignment just right. Spill protection: Ratchet-type fuel cap lets you know when it's fully seated, helping to prevent over- or under-tightening and fuel leakage. 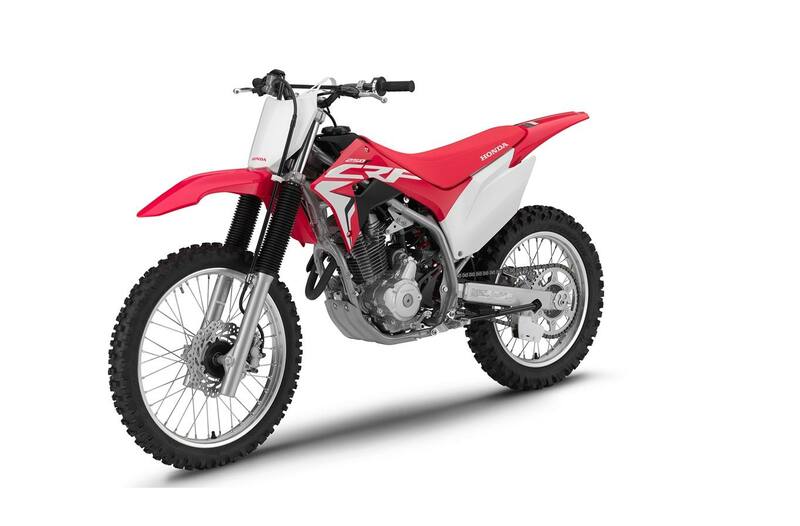 Reduced maintenance: Reusable foam air filter helps keep maintenance costs low. 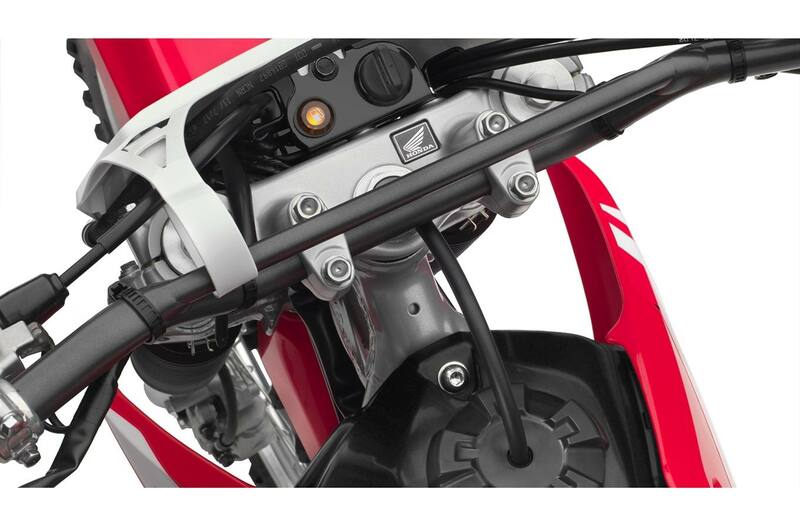 Folding lever: Folding shift lever reduces the risk of damage in a tip-over. 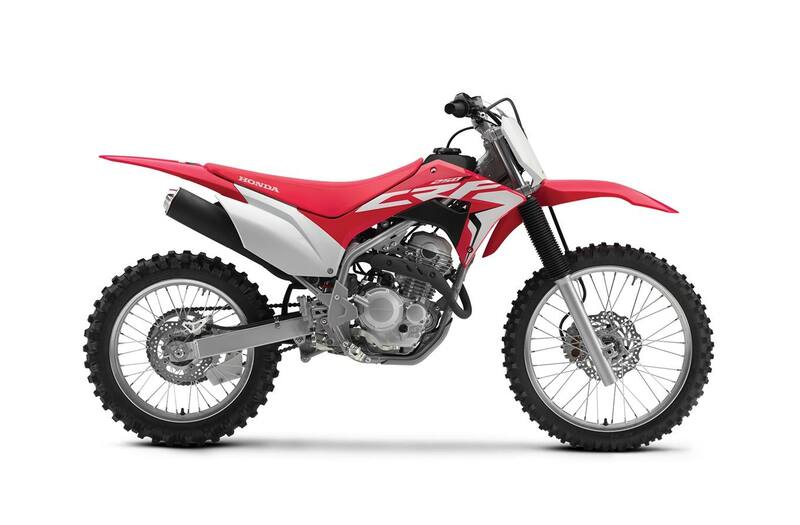 No slipping: Extra-wide cleated, folding, self-cleaning footpegs and brake pedal provide secure grip even in muddy conditions. Sealed battery: No mess, no fuss from the maintenance-free sealed battery. Extra security: Keyed ignition switch helps prevent unwanted use. 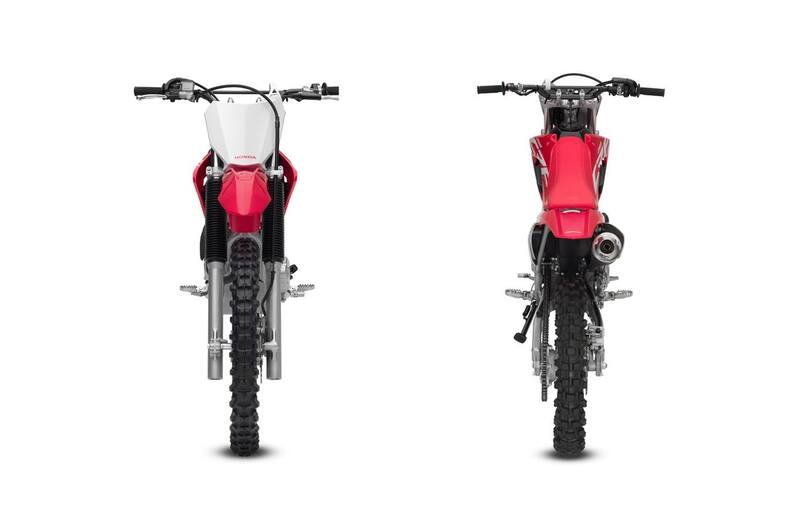 Sleek style: CRF-R-style bodywork looks great, and is built to take hard knocks.